While the rest of the country is battling sweltering heat (or so I hear, anyway), Seattle is being nudged into fall just a little bit sooner than most people here are ready for. 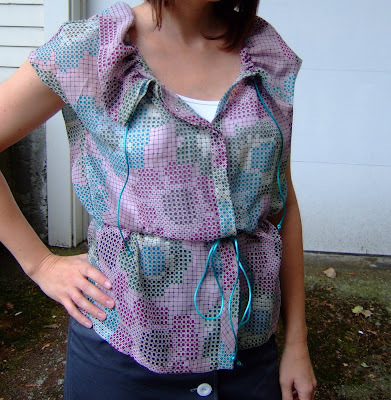 So my enthusiasm while working on this floaty, pastel-colored little blouse has been challenged by the grey sky that I've seen most mornings. 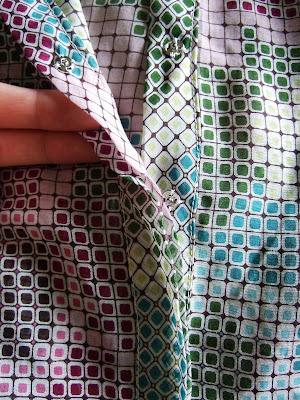 Sunny or not, I'm really happy with the way this blouse turned out and I look forward to wearing it, this year or next! 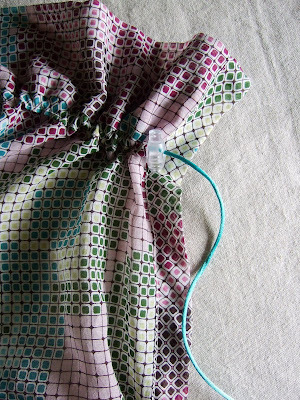 Likes/dislikes: This was my first time using cord stops, and it was kind of fun to purchase a new notion. Luckily I found them on my first try at my local fabric shop. Just a warning: the shape is not especially figure-flattering or slimming. I'm fine with that though, I knew that from the test garment. Fabric: Cotton voile from Emma One Sock that I purchased earlier this year. I purchased 2 yards at $14/yard, and I think I used most of it. Because of the grid pattern, I had to be careful of cutting out the pieces crooked, but ultimately the grid was nice to work with - I noticed that 2 squares were ~1/2 inch wide, so that was a handy way to maintain the correct seam allowance. The front band is doubled so the handsewing from the snaps doesn't show through to the front. Alterations/design changes: I cut the front bands on the bias rather than on the grainline so I wouldn't have to worry about sewing them perfectly straight. Because they were cut on the bias, they were a little hard to handle, stretching this way and that when I was sewing them on, and I don't think they are laying as flat as they could. I lengthened the overall length by ~2", and again I made only 4 beltloops rather than the 12 that the pattern calls for. 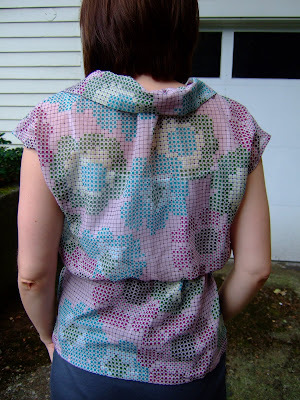 Conclusion: Fun pattern if you're looking for something a little bit different, and great for layering. That looks great! What a fun shirt, and a great step by step review of your process!! I love the blouse and the skirt. That skirt is a definite must sew item now.